Beautiful specimen certificate from the Corning Incorporated Company printed in 1947. 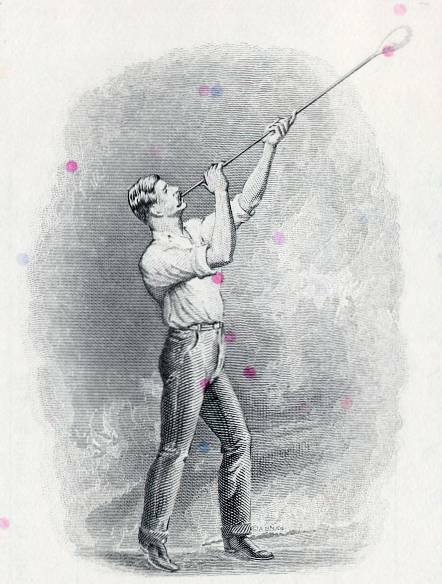 This historic document was printed by the Banknote Corporation of America and has an ornate border around it with a vignette of a man blowing glass. This item has the printed signatures of the Company’s Officers. Corning Incorporated NYSE: GLW is an American manufacturer of glass, ceramics and related materials, primarily for industrial and scientific applications. The company was known until 1989 as Corning Glass Works. Originally founded in the Williamsburg section of Brooklyn, New York, the company later moved its headquarters to the city of Corning, New York. In the fall of 1970, the company announced that its researchers had succeeded in making an optical fiber useful for long distance communication, having an optical attenuation of only 17 dB per kilometer, made from extremely pure silica glass doped with titanium. That invention resulted in Corning Incorporated becoming the world's largest manufacturer of optical fiber by the 1990s. As of 2004, Corning Incorporated is the world's dominant manufacturer of glass for liquid crystal displays in notebook and desktop computers and LCD televisions. The company continues to produce optical fiber and cable for communications, but at a reduced volume from the peak years of 1998-2000. It is also a major manufacturer of ceramic pollution control devices for catalytic converters in cars and light trucks that use gasoline engines. The company is also making a major investment in production of ceramic pollution control products for diesel engines as a result of tighter emission standards for those engines both in the U.S. and abroad. Other notable products manufactured by Corning Incorporated include mirror blanks for some of the world's largest telescopes, windows for all U.S. Space Shuttles and Steuben art glass. From 1982 to 1996, Corning owned Corning Clinical Laboratories; Corning did a spin-off of that business to their stockholders at the time as Quest Diagnostics. Corning Incorporated employs about 25,000 people worldwide and has annual revenues as of 2006 of $5.17 billion. Corning has been listed for many years among Fortune magazine's 500 largest industrial companies, and is currently ranked 456. It traces its origins to a glass company established in Massachusetts in 1851 by a member of the founding Houghton family. In 1918, it acquired Steuben Glass Works. Although the company is publicly owned, James R. Houghton, a descendant of the founder, serves as chairman of the board of directors (as of 2005). Wendell P. Weeks is president and chief executive officer (as of 2005). 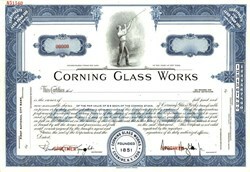 Other Corning notables over its 150 year history include: invention of a process for rapid and inexpensive production of light bulbs (in fact, Corning developed the glass for Thomas Edison's light bulb. ); early major manufacturer of glass panels and funnels for television tubes; invention and production of VycorTM (high temperature glass with high thermal shock resistance), and invention and production of CorelleTM (durable glass dinnerware), PyrexTM, and PyroceramTM (glass-ceramic cookware). Corning Incorporated is a global, high-technology company that has been changing the world through research and technological innovation for more than 150 years. By integrating scientific discovery with market need, the company has developed leading positions in the telecommunications, information display, and advanced materials industries. The company is an industry leading manufacturer and supplier of optical fiber, cable systems and photonic technologies for the telecommunications industry; and high-performance flat glass for television, information display and other communications industries. The company also develops advanced materials for scientific, semiconductor, environmental and ophthalmic markets. With more than 70 manufacturing locations, Corning employs approximately 24,000 employees worldwide. Its diverse portfolio of businesses are aligned under two major business sectors: Corning Optical Communications and Corning Technologies.